When the temperatures rise above 85 I can almost hear Lake Huron calling. 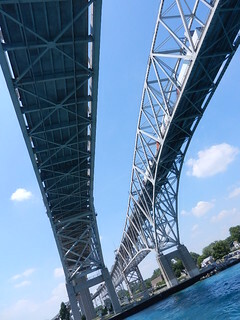 We are lucky to live close enough that we can simply take a ride along the water beginning at Lake St Clair and ending in Port Huron. Nothing beats the heat like being on the water! Sunday was a gorgeous Summer day, the sky was blue and the sun was blazing. With all the windows out of the Jeep, a generous coating of sunscreen, and the company of friends in their convertible, we were off. 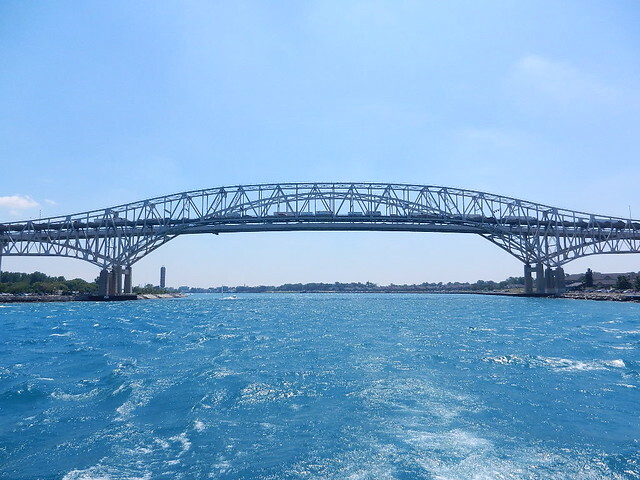 As soon as we got near the lake you could feel the temperature drop, it is a beautiful ride skimming Lake St Clair and then the St Clair River. We had made reservations on the Huron Lady II for the 1:00 river cruise. Our timing was perfect; we parked at Desmond Landing, checked in and were able to board the boat right away. We snagged some great seats on the top deck under the canopy. 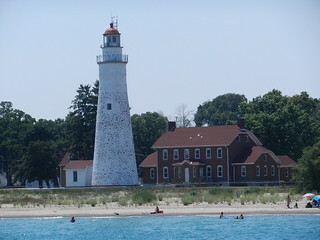 Lake Huron is the second largest of the Great Lakes and the third largest fresh water lake on Earth. The average depth is 195 ft and the maximum depth is 750 ft, Wow! 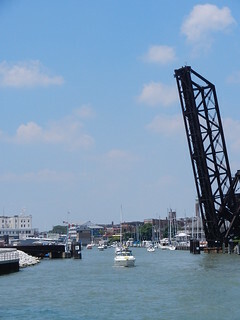 By freeway Port Huron is only about an hour from Detroit,but take the scenic route if you have the time. The Huron Lady takes you on a two hour ride; Covered outdoor seating is available on the top deck and air conditioned seating in the cabin. There are restrooms, cold drinks and snacks, everything you need. We began our journey traveling down river; sunlight glittered off the water, the narration calling out points of interest. A steady stream of boaters passed and waved to passengers, freighters carried their loads both north and south, using the space between them we made our turn north to the big lake. Lovely homes line the US shoreline, historic or newly built all take advantage of their waterside locations. As we approached the Blue Water Bridge things got more lively, traffic overhead was bumper to bumper going both ways on the bridge, people lined the boardwalk on each side of the river. 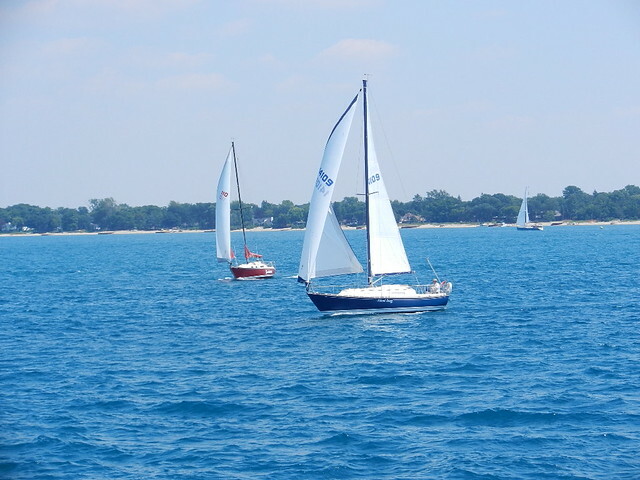 As soon as we flowed into Lake Huron the water seemed to go on forever, sailboats dotted the view making it quite a sight! Out into the lake a ways and then it was time to turn back, alas our voyage came to an end. You should definitely go for a ride sometime this summer, it’s well worth the trip. It was now 3pm and the four of us were starved, if you are looking for good food and a unique atmosphere the Palms Krystal Bar fits the bill. 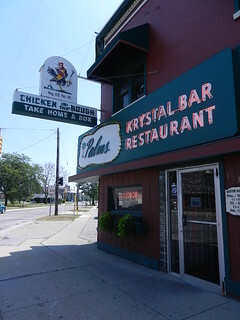 Located on Pine Grove Ave just outside of downtown Port Huron they are best known for serving “Chicken in the Rough”. This is an old-time chain from 1936 that served fried chicken, shoestring potatoes, a roll and a bucket of honey, all without the luxury of silverware. 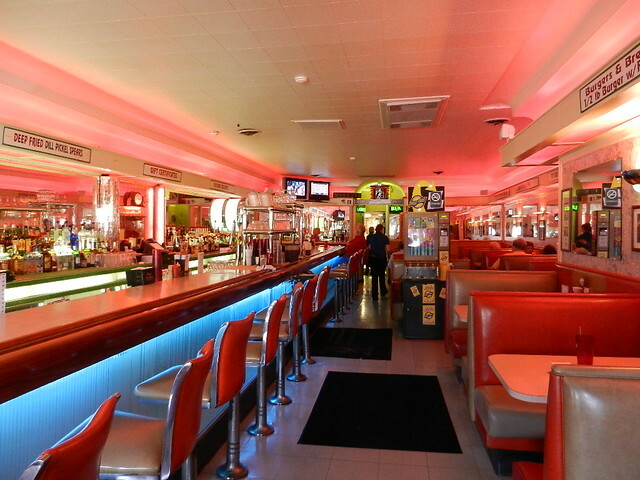 It actually feels like 1936 when you walk inside, a mixture of kitsch and Art Deco all backlit with a pink glow. Waitresses are super friendly, the fried chicken; finger- licking- good, you have to try it! 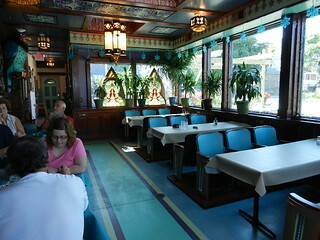 The menu offers a large selection; everything from salads and burgers to fish (get the Chicken) and home made desserts. Portions are nice-sized and prices fair, the place is so cool I’d come just to sit and enjoy the atmosphere. Our friends had to be heading home, but we were in no hurry. We had passed a little place on Military street a few times and thought it was time to see what it was all about. The Atrium Cafe and Ice Cream Parlor has been open nearly two years now, the outside is unassuming brown brick, street side parking is easy and free, there is nothing from the street that hints to what you will find inside. The truth is we were looking for a simple ice cream cone, we stepped inside and immediately knew this was no ordinary ice cream parlor. The entire interior is finished with items salvaged from homes, buildings and even a church from days gone by. 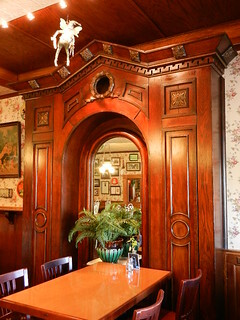 The wainscoting is actually vintage doors turned sideways, rows of theater seats are used as booths in the atrium. Everywhere you look is another amazing find. They have a full menu for breakfast, lunch and dinner, and of course ice cream! We were just going to get a cone “to go”, but they encouraged us to come in and have a seat, take a look around and enjoy our treat right there, I’m so glad we did. Somehow we went from a cone to a Turtle Sundae……Creamy butter pecan ice cream covered in Sanders hot fudge and hot caramel, whipped cream, nuts, and the traditional cherry on top. It was soooo good, the only challenge being you had to eat steadily to keep the butter pecan from melting, really, not a problem. This is just another gem waiting to be discovered in Port Huron.